Easily accessible to and from a number of Tanzania’s major cities and tourist destinations. Below are a few details on the arrangements you can make when you arrive to some of these cities. Alternatively, email us at info@capricornbeachcottages.com, or call on +255 768 811 551 so we can arrange a private taxi for you. All public transport from cities within Tanzania will bring you to Tanga, which is the closest major town. Take the public bus (dala dala). There are several daily services from Tanga’s bus stand. Take the bus to Pangani and tell the driver that you would like to drop off at Capricorn Beach Cottages, just before Kigombe village. This takes around an hour. Take a taxi, which costs approximately Tsh 60,000. The taxi stand is across the road from the bus stand. Or give us a call, we can arrange the taxi for you. This journey take around 45 minutes. Travelling by road, take the public bus. Ratco or Tahmeed have good buses. Both have regular daily service from Dar es Saalam to Tanga. This journey takes around 6 hours. Travelling by air – There are daily flights from Dar es Saalam to Tanga with Coastal Aviation and Auric Air. This journey takes around an hour. Travelling by road, take the public bus. Ratco or Tahmeed have good buses. Both have 2 buses per day. This journey takes about 8 hours. 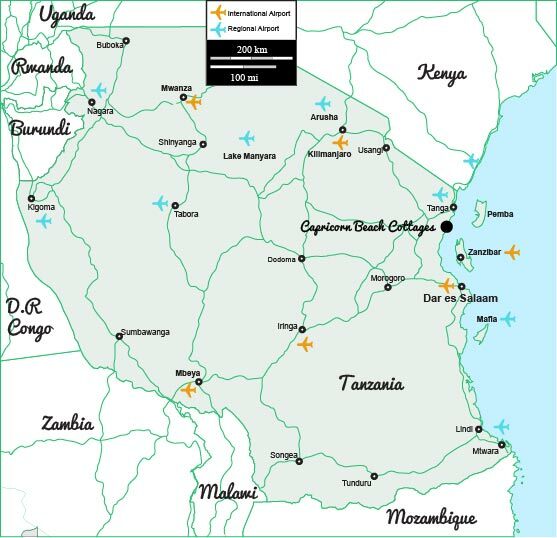 Travelling by air – There is 1 flight daily with Coastal Aviation which starts at Arusha Municipal Airport and also stops at Kilimanjaro International Airport. This journey takes about 1 1/2 hours. Travelling by air – Most flights from Dar es Saalam stop in Zanzibar and Pemba on the way to Tanga. This journey takes around 40 minutes. There are no direct flights from Ukunda to Tanga. The best way to make this jourey is to take a bus service, which is regular, from Mombasa stops in Diani on the main road to Tanga. This journey takes around 4 hours.